Formed 1966 in Long Island, New York and initially called the Pigeons, Vanilla Fudge arrived at a time when rock musicians were exploring virgin frontiers to the point where weird and wild became the standard practice. But Vanilla Fudge’s philosophy and approach stemmed from an entirely different dimension altogether. Consisting of Mark Stein on lead vocals and keyboards, Vince Martell on lead guitar and vocals, Tim Bogert on bass and vocals, and Carmine Appice on drums and vocals, the band specialized in slow and heavy cover versions freighted with symphonic arrangements casting eerie psychedelic illusions. 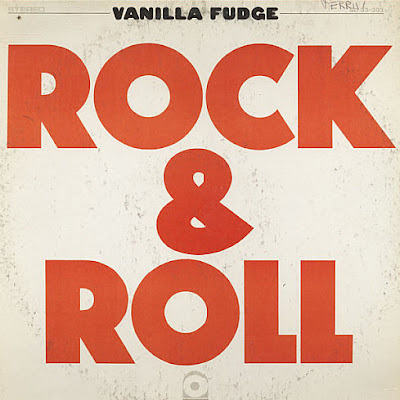 Commercial aspirations were clearly not the motive, yet Vanilla Fudge managed to score a couple of hit singles. An adapation of “You Keep Me Hangin’ On,” which was originally recorded by the Supremes, reached number six on the charts in the late summer of 1967, where a rendition of Trade Martin’s “Take Me For A Little While” that had been previously popularized by Evie Sands, cracked the top forty in the autumn of 1968. Although Vanilla Fudge’s unique and distinctive concept gained public approval, and in the process proved to be tremendously influential, a change of direction was displayed on the band’s fifth album. Aptly entitled “Rock & Roll,” the material ditched doomy orchestral accessories in favor of a stripped down delivery bristling with mass and volume. Vanilla Fudge were dynamic singers and musicians, and their amazing chops really shine through on this album. Powered by bellowing vocals, flaming with intent, “Need Love” and “Street Walking Woman” sizzle and squawk to the beat of hard rocking hullabaloo. Grungy guitars grapple with pile-driving percussion, culminating in a tone that is ugly and distorted, but bleeding with integrity. Gospel inspired harmonies, towering with size and strength, highlight the footstomping “Lord In The Country,” and a treatment of Gerry Goffin and Carole King’s “I Can’t Make It Alone” carries a tortured soul slanted feel. Executed at a moody and measured tempo, “The Windmills Of Your Mind” tips back to the sonic drama that made Vanilla Fudge so phenomenal to begin with. Packed with blinding jams and chaotic energy, the album certainly is rock & roll personified, particularly for the era it was crafted in. Not long after “Rock & Roll” was released, Vanilla Fudge broke up. Tim Bogert and Carmine Appice soon connected with guitar wizard Jeff Beck, and Beck, Bogert and Appice was born. But the legacy of Vanilla Fudge lived on, and it is the dead truth to say they were the first honest to goodness metal band. In 2015, Vanilla Fudge staged a reunion and cut an album, “Spirit Of ‘67,” that completely retained the sound and attitude responsible for their worldwide recognition.